This year is the fifth anniversary of the introduction of the RTI Act in Queensland. In 2014 we’re working closely with Queensland government agencies and private sector organisations to encourage them to highlight their commitment to right to information and open government. We are also presenting the annual Solomon Lecture. 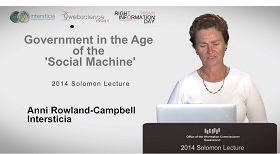 Named after Dr David Solomon, who reviewed Queensland’s FOI laws in 2008, the lecture this year features digital technology commentator Ms Anni Rowland-Campbell, who will explore 21st century government as a “social machine” and consider how such machines harness digital technologies in order to deliver better business practices and enable better accountability and transparency. The Solomon Lecture will be launched online through OIC’s website. We will be launching a range of new resources leading up to Right to Information Day 2014.